In the garden of decaying books in Quebec, around 40,000 books have been quietly rotting to become part of the forest over the past couple of years - originally an installation for the International Festival des Jardins de Metis, now helped by the addition of mushrooms and moss. "Culture is fading back into nature" say Thilo Folkerts (architect) and Rodney LaTourelle (artist) behind the project. 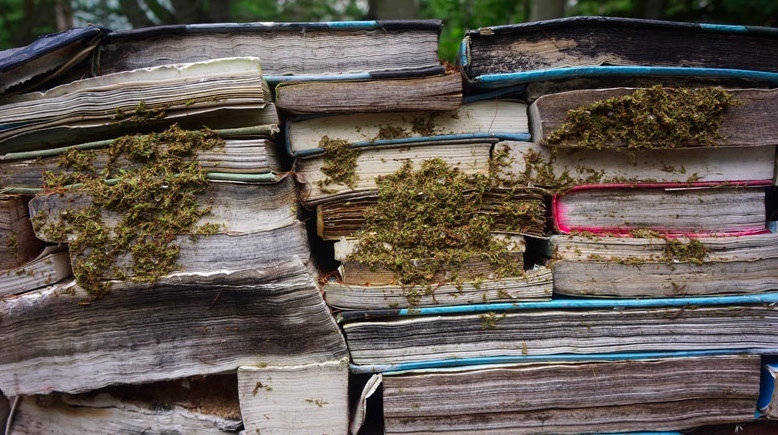 It's like one of those fantasy images of some character reading a book in a forest who becomes so absorbed for so long they become part of the forest, except here it's the books dissolving into the landscape. Which somehow makes it ok. At least it's not like words turning to dust.